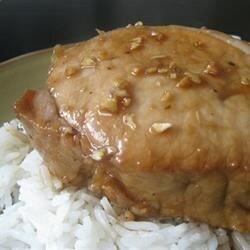 "These sweet and tangy pork chops are flavorful and very easy to make. I pour the marinade over the pork chops in a freezer bag, then freeze them for future use. I take them out of the freezer the night before I want to serve them, and thaw in the refrigerator. By dinner time, they are ready to bake, making a quick and delicious meal!" I thought the flavor was good and the chops were tender, however the sauce did not "reduce" for me at all, even after doubling the baking time. I wouldn't recommend this dish. My husband, who is NOT a fan of pork chops, said after eating this meal, "You can make that one again! That was really good!" Whoo hoo! Good marinade, I left it overnight in the fridge and the meat was very tender. On the BBQ, the marinade does burn easily and is hard to cleanup. Easy and tasty. I cooked the chops in the same dish that I marinaded them in.